For those wondering what Nike would do with the NFL license after the disappointingly and expectly overhyped unveiling ceremony, they finally showed some of the benefits of their freshly enacted apparel deal with their 2012 “NFL Draft Pack” of sneakers. Gimmicky, but I like it. You say you love the Eagles but your team-related footwear options are limited? Boom– NFL Draft Pack. Simply, Nike chose eight signature sneakers, either classics from the past or noteworthy current shoes, assigning one to each division, then laying out a custom colorway for each team within each division. Luckily, Nike chose one of their all-time best designs, the Air Max 95, for the NFC East. Here are the rest of the NFC East Air Max 95s (No-Sews). The Redskins version is fantastic. I’m not sure I’d be able to pull off actually wearing them, but it just proves how well their color palette comes together. The Cowboys and Giants aren’t quite as interesting, but I can’t really find fault with either of them, with the Giants, well, “Big Blue” approach working quite well, though I wouldn’t have minded some silver on the Cowboys [editor’s note: I see purple?]. Counterkicks has close-ups of each team’s sneaker. Some notables: the AFC West in the Nike Air Trainer SC (you may know them as “Bo Jacksons”) and the NFC North in the Air Max 90 (also known as the original Air Max). Also, the Buccaneers’ Free Trainer 5.0 and the deceptively complex Free Haven 3.0 looks good in any color (even neon green) are new designs which are only enhanced by this NFL tie-in program. Here are all of them for the entire league. I’m giving this whole pursuit a big thumbs-up. Which ones do you like? via Nicekicks and Counterkicks, two great sites for sneaker news. Those that know me and read the website (I’d wager the two are almost mutually exclusive — except for the ragtag bunch of misfits that Nate drags in) know that my Youth was marked by complete, abnormal interest in a variety of subjects. I’m not sure of the exact order, but it went something like this: dinosaurs, space, birds, Star Wars, airliners, fighter jets, and what I’ve sort of landed on now, computers and cars. That’s all well and good as it could be, and until very recently (yesterday, to be exact), I thought these phases were the be all and end all of “where I was” at a particular time, the landmarks (or buoys) on to which everything in my past had been tied. As in, when I’d page through my old, binding-suffering-because-of-overuse copy of Audubon’s Field Guide to North American Birds (1994 edition, of course), I’d remember X, Y, Z that happened around that time. Same thing when looking through my old space books, the binders I put together about airplanes, my dinosaur toys, etc, etc. I had thought that those were it for “way back when.” I think the reason for thinking in these terms is that each stage stands alone as a very discrete point in time. I can’t put my finger on exactly when I was interested in airplanes, but it was after such-and-such and before other such-and-such. Obviously, this isn’t how life goes, it’s rare for there to be a finite and complete “end” to something. Sure, I still remember bits and pieces from each “stage,” but I’m not usually adding more to whatever it is that I know and remember about each. I hadn’t put much thought to it, but these academic pursuits really only have memories about the particular subject associated with them: sitting in the cold, convincing myself that I was always just one more roll of film away from taking a picture good enough for Birder’s World with my crappy camera, and on and on. That’s the sort of thing I remember when I look through my old bird books. That’s all well and good, but as I’m looking at it now, I must not have been a very interesting kid, only remembering things related to these rather niche interests. So that leads us into yesterday. Oh, the memories. Sort of. 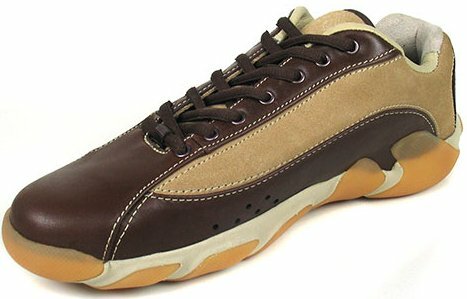 It goes on and on, looking at any of the high profile sneakers from 1990-1997, lots of stuff I didn’t realize I remembered. But it ends there in 1996/1997. Sneakers after that don’t elicit anything. I thought about it for a while, and I realized why. That’s when simple things like sneakers were phased out by a more serious interest in music. Like anyone “young,” I had always enjoyed TV, movies, and Top 40 radio, but around 1996/1997 (14 or so years old) most everyone has had a couple serious years acquiring his or her own personal taste in music. Before that point, oddly enough, sneakers provide those “temporal landmarks,” but after that time, it’s really music that reminds me in that same way. Of course it’s not just music, there are all sorts of “touch points for memories:” textures, smells/scents, pretty much anything, even the way a Chevrolet Lumina’s steering wheel feels. But none of this is news to anyone, we’re all simply interested in different things at different times in our lives. 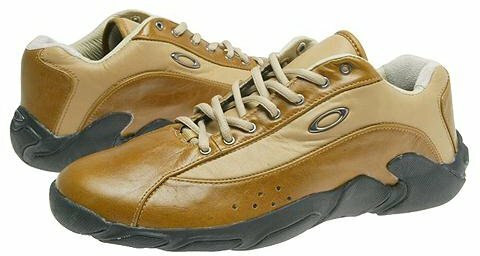 I had sneakers, but I’m sure other guys (and girls) have video game “sponsored” memories (I have some of those, mainly from being at friends’ houses, what with my mom associating video games with some sort of figurative devil) or memories when you find a Goosebumps book in the basement of your house. Navel Gazing Part 2: Sneakers as Temporal Landmarks receives three-and-a-half stars due to its main point’s obviousness as the review went on. The hyper-ambitious title perhaps hinted at possibilities left unanswered and avenues unexplored. Also, I’m a firm believer in sneakers being the ultimate artifact of contemporary design for point in time (heck, look at that Air Jordan overview, and see how the shoes from the early 90’s, with their neon colors, which were the new hotness™ way back when — my goal for the too many pairs of Oakley shoes I have is that they’ll be a bit more long-lasting in terms of style), and I’ve not touched on that concept one bit above. Here’s a bit of a different topic for review: sneakers. I’m not sure if it’s a bit of a vain topic (what are we going to review next, Seersucker Suits?! ), but I’m pretty enthusiastic about this particular pair of footal (it’s a word as far as I’m concerned) accessories. I’m sure most everyone else doesn’t care about it, so stop reading here if you want. I feel liked a kid in a…shoe store. History for history’s sake: Oakley’s best known for their aggressively styled sunglasses and “extreme sports” gear. There’s something to be said about designing a functional, fashionable product that still stands today as functional and, even more mind-bogglingly, fashionable today, and their M-frame sunglass product has been around since at least 1993 is testament to their industrial designers’ and product engineers’ abilities. 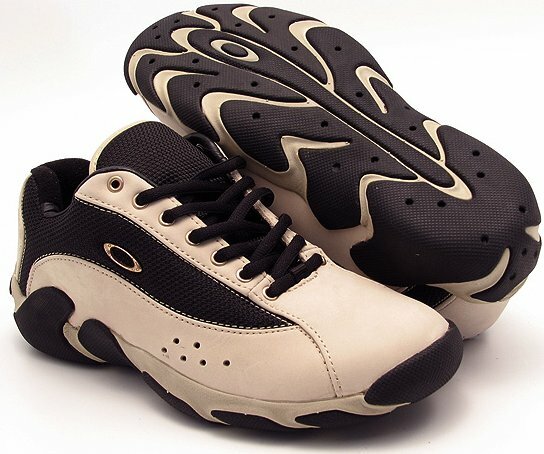 I had known for a long while that Oakley made sneakers though they were always a niche product: few people wore/owned them, but they were (and are) one of the few brands which makes entirely black and entirely white sneakers. That doesn’t sound very significant, but think of how many all-black sneakers you’ve seen. Sure, there are plenty of all-black shoes, but not athletic sneakers. I’ve seen cooks, chefs, and that guy who thinks there just might be a pickup basketball game after church and he’d better have appropriate footwear (the all-black Oakley sneakers), if only because they’re the only game in town for that tiny niche of needing to look appropriate in church and on a basketball court. Jump forward some number of years later, and as I was doing research for a project for a friction class in college in early 2004, I came across a picture and review of the Oakley Twitch. Unfortunately, the website, kicksology.net, was “retired,” the article no longer available, even to the WaybackMachine and Google’s cache. 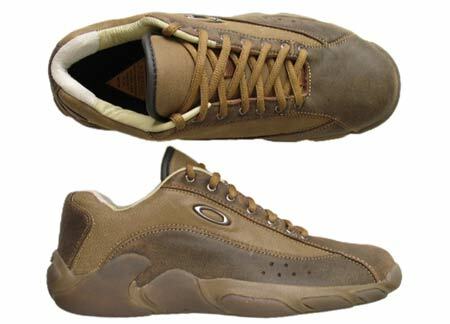 Finding no other review (or even much discussion) online, I guess that makes me the official messenger, as the sneaker as been discontinued, so even Oakley’s website doesn’t mention it. The image of the shoe so impressed me that I decided I was going to buy a pair ASAP (there are few products (or “anythings” really) of any sort that move me in a such a way. 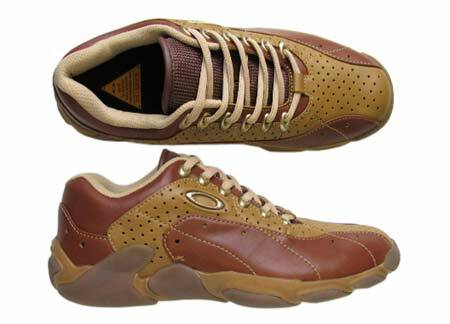 Knowing that Oakley shoes were hard to come by, I vaguely remembered that Amateur Athlete (in the Westgate Mall in Bethlehem, PA — tagline: “Westgate Mall, The Mall Time Forgot!”) carried the Oakley brand and hoped they stocked the particular sneaker. My second day home for spring break, I visited the store to find that not only did they have the model, they had it in my, not rare, but infrequent size, 13. I’ll go into colors and details later, but they had the “Storm” colorway with the awkward but endearing rubber Lip feature (or it a Nose). 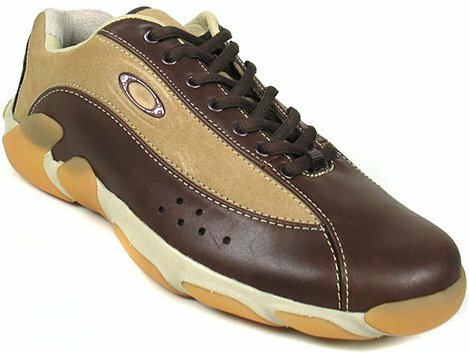 Truth be told, I was hoping they’d have the same sneaker from the kicksology review, the Brown-Tan colorway with Lip/Nose, but it was close enough. 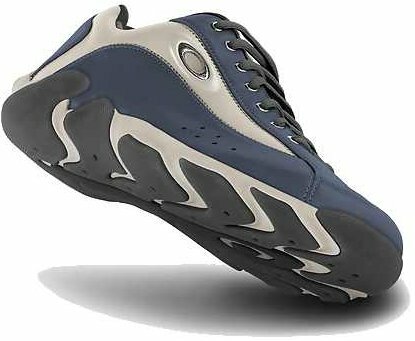 A tour of the shoe: the outsole has an aggressive pattern than looks as if it were constructed by taking numerous pieces of rubber, and arranging them on the sole. What makes the outsole different is that it, like the “lip,” extends onto the instep and outstep of the sneaker, again visually mixing different functional parts of the sneaker. It looks aggressive without the “my sneaker can beat-up your sneaker” look of some sports sneakers. As the previous pictures have shown, the body of the shoe isn’t over-the-top, but it’s still eye-catching. First and foremost, I’ll say that I prefer the Normal/”Nose” variety, but being that those are as tough to even find pictures of online, I won’t make a distinction. I’ll start with the three pairs that I own (most of these pictures were found online, not taken by me. You’ll definitely be able to tell which ones are of shoes I own/have worn.). Storm (Blue, Light Blue, Blue is rough suede, light blue is smooth suede) — first pair purchased. This colorway lends itself a “sporty” but not particularly “athletic” look. 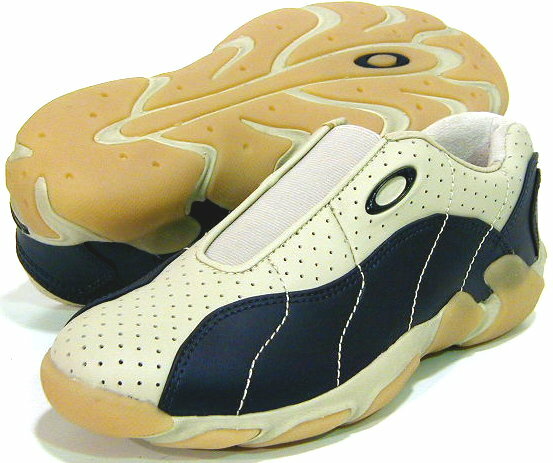 Light-colored rubber with white mid-sole. Tan/Honey (both leather) — Second pair purchased (as of today , haven’t yet made the yearly sneaker rotation). More “serious” looking. Black rubber with black mid-sole (exclusive to this colorway). Frequently found at Overstock.com. I don’t think this colorway is available with the nose/lip. These shoes got beat-up especially quickly because of the tenderness of the leather and lack of the rubber nose. Dark Brown (Brown/Light Brown*leather/suede) — Third pair purchased; at least one year away from becoming rotated in. “serious” looking. Almost “dressy.” Brown rubber with brown mid-sole. 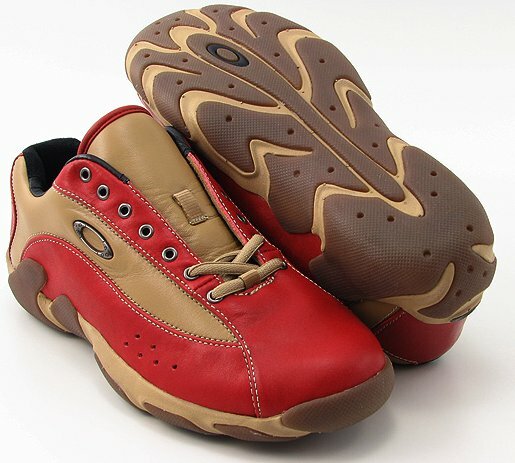 I do not believe this colorway exists in a nose/lip variety. 2011 comment: I wear these very rarely because the leather is so sensitive to scratches. Oatmeal (Black and Off-white) — Sort of silly looking. Relatively common on ebay [in 2006]. Black rubber with white mid-sole. With the nose they look a bit less silly; I found a pair with the nose on eBay for the right price. Ocean (Navy Blue/Light Blue) — Good mix of colors. Sometimes found in random sizes through Froogle.com [2011: remember Froogle?!]. 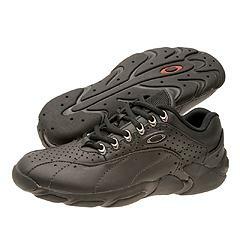 Black rubber with gray mid-sole. I do not believe this colorway can be had with the nose. Cement/Navy (White/Navy) — Most “athletic” looking of all colorways. Almost looks like a cross-trainer type sneaker. Only able to find one picture in the billions of pages Google indexes. Some have shown up on eBay and I’ve found more pictures. 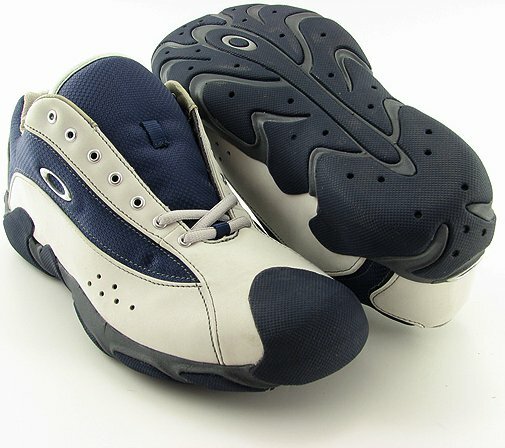 Dark blue rubber with gray mid-sole (blue rubber exclusive to this colorway). Here’s one without the nose. Red/Tan — bright “casual” look. Frequently on eBay (but never in the right size. 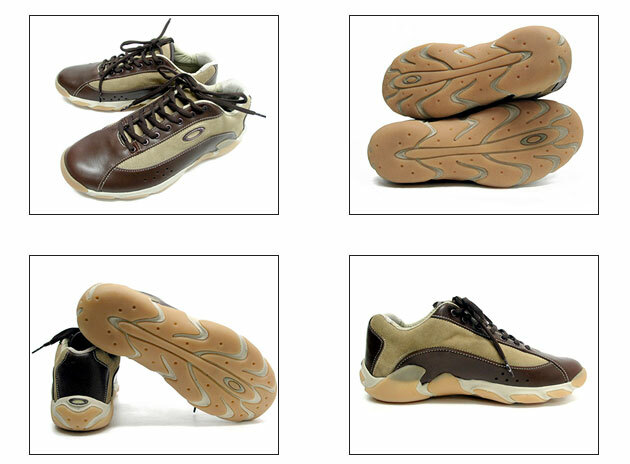 Brown rubber with tan mid-sole. I’ve never seen this colorway with the nose. 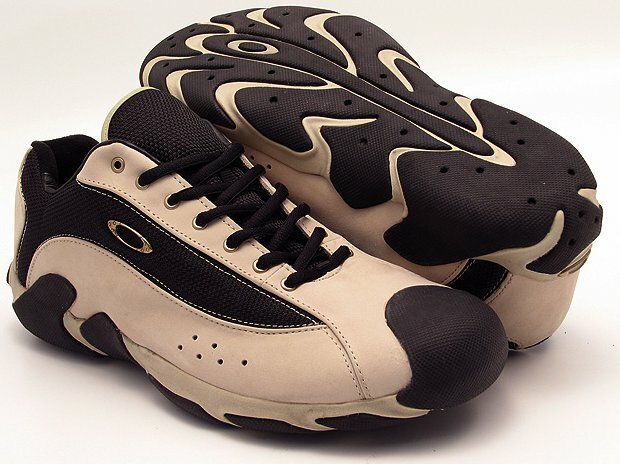 Well, I think that might be the most thorough discussion of that topic since the design of the shoe within Oakley. The Oakley Twitch receives 5 big stars for being impossibly cool-looking and all sorts of comfortable as well. Sure, some of the colorways aren’t that appealing (I’m looking at you, “Oatmeal”), but the successful varieties create a sneaker that doesn’t look out of place at events where sneakers aren’t normally allowed. 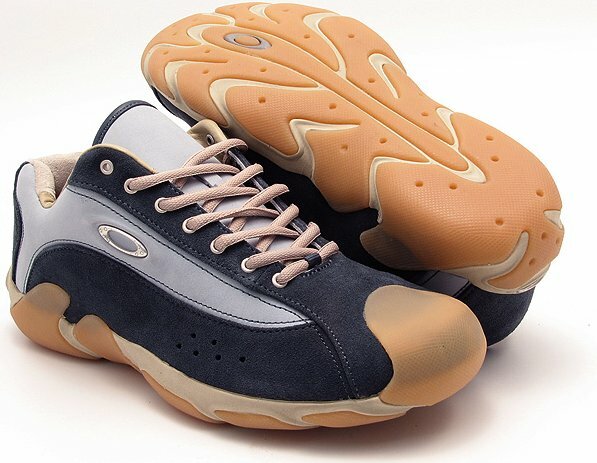 The fact that Oakley discontinued the sneaker doesn’t help or harm its rating; I’m sure that if the designer were to have things his or her way, it’d still be widely available. 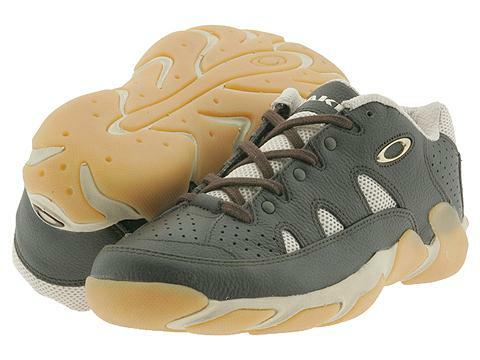 Really, if you come across a pair of size 13US Oakley Twitch sneakers, buy them, no matter what color they are. I’ll pay you back. (Um, if anyone actually takes me up on this offer, let’s set a limit of $50 for the sneakers.) The Coil Over, Flinch, and Coil are similar in design to the Twitch, and being that the Coil Over is my current sneaker (its year is up in April), I can assure you that it’s not the same.